It's important to note that we have two different celebrations here at Cowell - Family Dinners, and Cowell College Nights. Cowell Family Dinners, formerly known as College Nights, have been a Cowell Tradition for over forty years. These special evenings include a program featuring music, dance, drama, comedy, Cowell Assembly meeting, student talent, or multicultural enrichment. Family Dinners are attended not only by students, but also by faculty and staff, sometimes with their families. 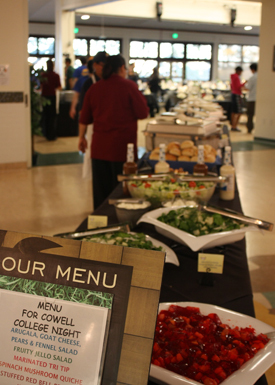 Cowell College Nights are open-style format, with a program occuring during the event, but allow students to come in and out during the entire event, with the food being buffet style. Programs for both Cowell Family Dinners and College Nights are planned by students, staff, and faculty. These gatherings of the Cowell community are not to be missed! Menus for College Nights and Family Dinners are imaginative, diverse and scrumptious! Students are very involved in the menu planning process. In the recent years food themes have included Italian, Persian, West African, Mexican, Japanese, Thai, Indian, Filipino, Italian, and more. Cowell kicks the quarter off right with 1 Family Dinner in the beginning of each quarter, and then 2 College Nights spread out over the quarter. For any questions about College Night or Family Dinner, feel free to stop by Cowell Programs Office, Room 133 or email cowellprograms@gmail.com.